Upgrade KitKat to lollipop in Micromax Canvas Nitro A310, A311: It’s been a very long time since I was planning to prepare a tutorial on how to upgrade from KitKat to Lollipop in Micromax Canvas Nitro A310, A311 Phones. There are no OTA updates to upgrade from KitKat to Lollipop in Micromax Canvas Nitro A310, A311, so the only option left out is to upgrade it forcefully using the custom ROMs available. The procedure is bit tricky and it involves rooting your Micromax device and installing the Custom ROM to Upgrade from KitKat to Lollipop in Micromax Canvas Nitro A310, A311. Even though rooting your Android device will void your warranty, you should do it in order to upgrade from KitKat to Lollipop in Micromax Canvas Nitro A310, A311. The entire process is bit new for those who are new to the custom ROMs world, but it is not impossible. I recommend you to follow the process carefully as any mistake you do will brick your phone or ends it useless. 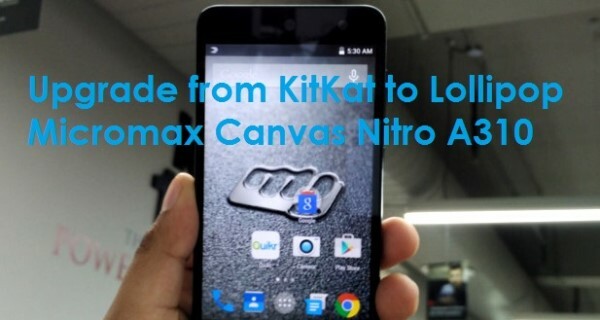 There are just 3 steps to follow to upgrade from KitKat to Lollipop in Micromax Canvas Nitro A310, A311. Do no mistake and you will be done with the upgradation. You need to root your Micromax device to gain the super user access. You can now root it using a simple software called iRoot. It is available both for Android and Windows PC. I recommend you to download iRoot for Windows PC and then root your Phone. 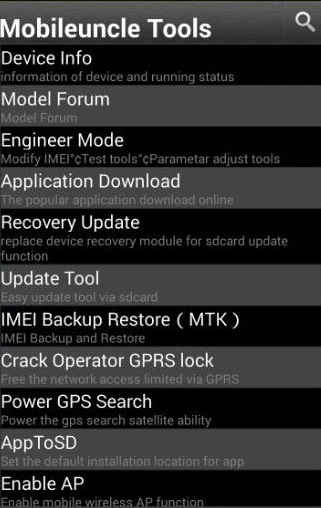 You need to download Clockwork Mod Recovery for Micromax Canvas Nitro A310, A311. Installing custom ROM to upgrade from KitKat to Lollipop in Micromax Canvas Nitro A310, A311. I will now guide you by elaborating the steps I mentioned above and help you to upgrade from KitKat to Lollipop in Micromax Canvas Nitro A310, A311. Before proceeding any further, backup all the data to your PC to overcome the data loss after the upgrade from KitKat to Lollipop in Micromax Canvas Nitro A310 or A311. Luckily, we have a tool to root Micromax Canvas Nitro A310 device without much difficulty, and iRoot is the tool which is available both for Android and Windows Platform. You need to first download the Micromax A310 drivers and install it on your Windows PC. Once after the drivers are installed, you need to start iRoot on Windows PC. Connect your Micromax Canvas Nitro to PC using a USB cable. Go to Settings -> Developer Options -> Enable USB Debugging mode. Now, just click on the Root button in iRoot and wait for some time. It will automatically reboots once after the rooting is completed. Now you have rooted your Micromax device, and the second step is to install the Clockwork Mod Recovery on your Micromax Canvas Nitro A310 or A311. The next step is to download the Clockwork Mod recovery and place it in the root directory of the SD Card. The next step is to update the Recovery which you can done using the Mobileuncle Tools app. Download Mobileuncle Tools for your Micromax device and install it. Once it is installed, launch the app and select Recovery update. It will show you the image you the image that you placed in the root of SD card. Just tap on it and the phone will ask you for a reboot. Proceed to reboot the device and it will install the Clockwork Mod Recovery on your Micromax Canvas Nitro A310 or A311. It is the last step to upgrade from KitKat to Lollipop in Micromax Canvas Nitro A310 or A311. Before that make sure that all the data is properly backed up and the battery is more than 80%. Now copy the downloaded Custom ROM file to the SD card and launch the Mobileuncle tools app again. Select Update Tool option and it will show the zip file you have copied to the SD Card. Click on the zip file and it will boot into recovery mode. Select wipe cache option once you are in the recovery mode, and then choose Install/Apply zip option. Now it will upgrade from KitKat to Lollipop in Micromax Canvas Nitro A310 or A311. It will take some time don’t become tense and worried. Now, you have upgraded from KitKat to Lollipop in Micromax Canvas Nitro A310 or A311. Hope you have completed all the steps and upgraded your Phone. If you face any issues in the process, please comment us.